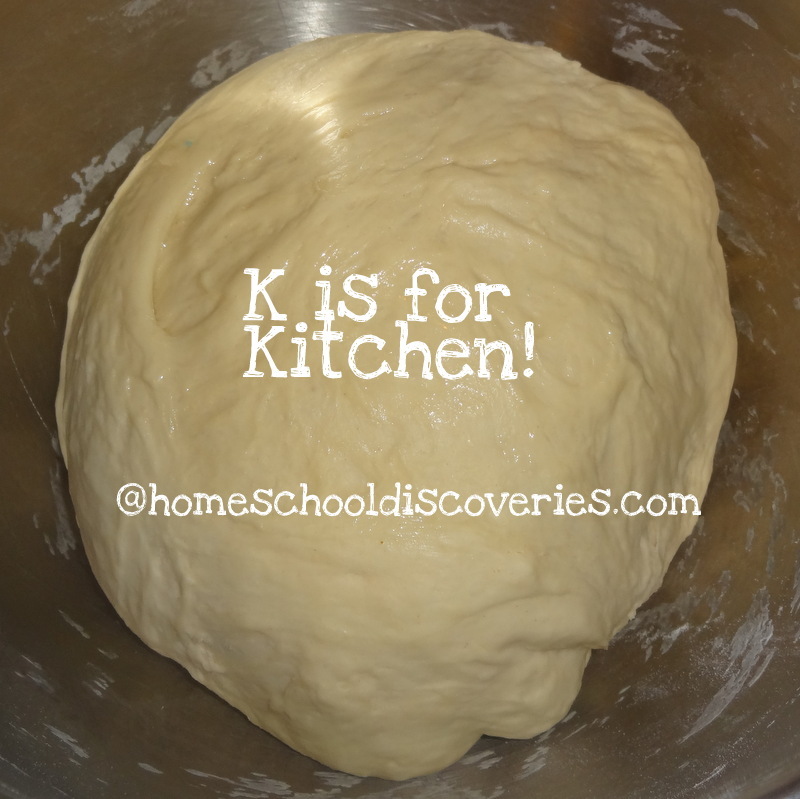 I think most kids have at least some inclination toward wanting to help out in the kitchen. And since I love to cook, I’m not surprised that my kids seem to have quite a bit of desire to help out and learn. Even the toddler, Mr. J, seems to count pretending to “cook” with my pans and spoons (and possibly scraps of real food if he can find any!) as one of his favorite activities. While I generally let my kids “help out” a bit as soon as they are old enough to stir and crack eggs, I’ve noticed that it has been in the past six to nine months that Miss M (who recently turned 9) has been really capable of cooking on her own in a very complex way. She has been able to do a few simple kitchen tasks for a few years, like browning ground beef, making scrambled eggs, or heating up soup and making grilled cheese. But this year as her math skills, attention to detail and patience have grown, she is able to follow a recipe from start to finish. Miss M and I both enjoy baking, both yeast breads and desserts, so it has been natural for us to start there as she grows in more cooking independence. After working closely together on a number of projects, Miss M ventured out and made M & M Blondies (a cookie bar), pizza dough, and an Italian Breakfast Bread almost completely on her own! For the Blondies and Breakfast Bread, I let her explore on Pinterest to find a recipe that she wanted to make. Next, I want to be a bit more intentional at helping Miss M learn how to make the staples of our dinner menu rotation. She finds this to be a bit less exciting…but I would love to see her capable of making most anything I make by the time she’s in high school. I’m planning to start a “cookbook binder” of sorts for her, and add recipes as we make them together (and make sure she gets a chance to make each one on her own too). One thing I’ve always been so happy my mom did for me as I was growing up, was that starting in Junior High and continuing through High School, she asked me to take one week every summer where I was in charge of our dinners from start to finish. I planned the menu, made the grocery list, helped with the shopping and then made each dinner. I tried new recipes, as well as practicing family favorites, and I felt well-prepared to cook and plan menus once I was out of college and on my own. As the kids get older, I’ll be asking them to try their hand at doing the same thing. Right now, the focus of my cooking instruction has been Miss M — but I am sure the boys will be following close behind. They will be learning how to cook as well! I’m not sure if they will develop the passion for it that Miss M seems to have, but they at least need to know the basics. 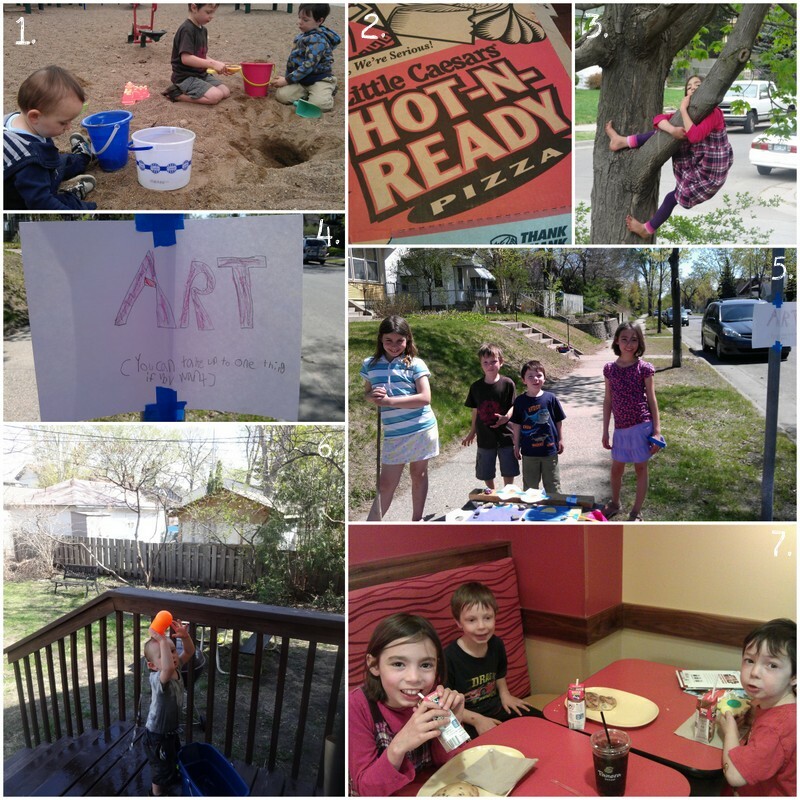 We’ve been on “summer break” from our regular academic-year homeschool schedule for just a bit over a week now…but it hasn’t felt like summer yet. Last week was busy with a flurry of special activities, then we went out of town for four days…and today was cool and rainy. It’s looking like a cool and rainy week here, but hopefully by the time June and July roll around, we’ll really be enjoying some summer weather! Last year we went all out and made a huge bucket list at the beginning of the summer. We haven’t done that this year (at least not yet), but I’ve been forming a general outline in my head. I’ll be using this to sit down with the kids soon to fill in a few more details and find out what they have been dreaming of doing this summer. Summer history/geography theme of learning about our state (Minnesota) — We’ll read some fiction and non-fiction, and Miss M may make a lapbook or notebook…plus the field trips of course! Math review — Miss M and Mr. E will focus on math fact review with RightStart math games, iPad games, and maybe some “fun” worksheets (as fun as worksheets can get, I guess! I bought a few interesting e-books from the dollar sale at Scholastic Teacher Express that might come in handy). Beyond that…we’ll find plenty of ways to have fun, I’m sure. Water gun fights, ice cream outings, field trips to other local attractions and time to play with friends will definitely be on the agenda. 1. Swimming at an indoor pool (we received two one-day family passes almost two years ago to a pool not especially close to home, and we finally got around to using one of them). 2. Last weekend Tony built the kids a giant sandbox, and got it filled with sand on Tuesday afternoon. 3. Miss M celebrated her 9th birthday on Tuesday with an “old fashioned”-themed birthday party that evening. 4. – 6. Miss M’s wish for the day of her birthday was to visit the MN History Center — everyone had a blast. We saw two newer exhibits — one aimed at kids about MN history in general, and one about Minnesota’s role in the Civil War. 7. Miss M and I made cake pops for a end-of-year co-op picnic on Thursday. They were just as hard to make as I always feared they might be. 😉 Luckily they tasted good and were snatched up in a few short minutes at the picnic. 8. – 9. Enjoying a long weekend hanging out at Grandma’s house with swings, monopoly and lots of room to run and play. Hope you have a wonderful Memorial Day Weekend! Whoo-hoo! It’s Friday, our standardized testing is done for the year, and we’re calling it a wrap on this school year. 1. Miss M had our required-by-state-regulations standardized testing this week. We opted to do the Iowa Test of Basic Skills with our homeschool co-op. It gives Miss M a quiet environment away from siblings, (and with no worries that I might not be a fair test administrator to my own child). On Monday and Tuesday I read a test to a younger student from another co-op family (and the boys played with other siblings too young to need to test). Then on Wednesday while 3rd graders and up continued testing, I took the boys to play at a park. 3. Miss M is thrilled to now have more time for outdoor pursuits…like trying to climb the tree in the front yard. 4.-5. Miss M and best friend Miss J from across the street had the brilliant idea of a “free art” stand. They get to have fun chatting with neighbors and others who stroll by, and I get the side benefit of less paper accumulating in the house. I told them they can definitely do this one again! 6. We had one surprisingly hot day in the middle of the week, surrounded by warm or even cool days. The temperature was over 90 degrees on Tuesday, but unfortunately our outside faucets were not on yet and I couldn’t manage to get them on myself. So, the kids enjoyed water guns and buckets of water. Mr. J can’t quite figure out the water guns yet, but he could definitely use part of one of the guns to cool off the “old fashioned way” (aka just dumping the water on his head!). 7. Today was our “official” (as I determined it) last day of school for this school year. I had originally planned this for next week…but the way our schedule was shaping up, we’ll not have a single “ordinary” day. And we always call a summer break by Memorial Day. So today (among a couple other errands), we bought a few new books for summer reading at Half Price Books, and went to Panera for a treat and to discuss our favorites, least favorites, etc from this year (that will deserve it’s own post, perhaps, another day). This afternoon I’d like to do some clean out of school supplies, books and papers…but I am not sure that is going to happen. I guess that’s what “break” is for! It feels good to be on break…like maybe I can catch up or begin on a few projects and goals of my own. I promised the kids I wouldn’t bug them about any summer schoolwork/review for at least two weeks (though I am still going to try and keep Mr. E practicing reading…I’m afraid even two weeks would be too long of a break for him with his budding reading skills!). 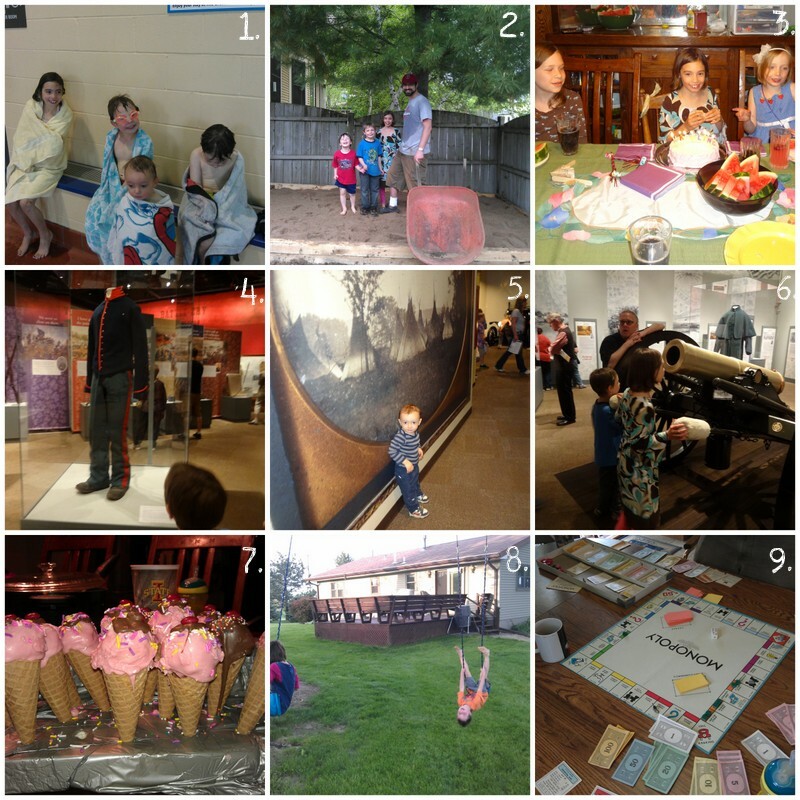 Then once June rolls around, we’ll add in math review/games, learning to type (at least for Miss M, and maybe Mr. E), and a summer study on our state’s history (coupled with plenty of field trips, of course). At some undermined point (July? ), we’ll add back in a few new lessons in some subjects…leading up to two weeks of vacation in the end of August, then a full start to the new school year on September 3rd. Good times! But for now, bring on the Summer Bucket List! I don’t have very many distinct memories of books I read as an elementary-school aged child. I do remember a few book series I enjoyed reading, like Nancy Drew, The Babysitter’s Club and Sweet Valley Twins (Ugh, anyone else remember those? I distinctly remember also that as a girl about Miss M’s age, my mom said I was not allowed to read the “high school” series from Sweet Valley. Good call, Mom!). As far as individual books go, Island of the Blue Dolphins by Scott O’ Dell is one of the few I clearly remember reading. I also remember that after reading it, I incorporated it into my own imaginative play as I pretended to be the main character from the story. I’m fairly sure I read it in 3rd grade (based on my memory of which house I “played” this in, from the many I lived in during childhood). So it was a natural choice to add Island of the Blue dolphins to our read-aloud this for this year. Though I am sure it is one Miss M could have handled on her own, I definitely wanted to share the experience of this book together with her. I entered into it with some apprehension, however, that I might be disappointed in the re-read of this book that was so highly regarded in my memory! Luckily, I was not disappointed. I think I enjoyed it just as much as I remember having enjoyed it when I was Miss M’s age, and Miss M said it was one of her favorites of this year as well. While this strikes me as a book many of us probably read as a child, here’s a brief recap of the plot: Karana is a girl living with her small tribe on a remote island off the coast of California. The population of the tribe is decimated following a battle with a group of Aleut hunters who have come to the island to hunt otter. Eventually the decision is made that the remnant of the tribe must leave the island. The tribe’s chief leaves to get help from the mainland, and a ship arrives to take the tribe away. Karana’s brother, however, is not found aboard the ship as it is leaving the island, and Karana abandons the ship to find her brother, knowing they will be left behind. Karana’s brother is killed by wild dogs soon after. (I suppose this could upset some sensitive readers — but if a potential reader/listener reads the summary on the back of the book before beginning, they will have a sizable hint that something must happen to her brother, as the summary states she is alone on the island!). Karana is thus left alone on the island to find her own way to survive — for what she first believes may only be weeks, months or a year — but for what instead turns out to be 18 years before a ship finally arrives that takes her to the mainland. Karana’s story is one not only of survival, but of finding friends in unexpected ways, of harmony with her surroundings and of finding peace in difficult circumstances. I grew up as an only child (in my immediate household — I have half and step siblings I did not live with), and I think that I could relate to Karana’s “aloneness” in some ways. Other than that, I find it a bit hard, actually, to put my finger on why I liked this book so much as a child and still like it now. Clearly, I don’t directly relate to her experience of being alone in my current living situation (quite the opposite — I definitely would appreciate a few more moments of peace and quiet!). I suppose I might be most drawn to Karana’s strong sense of resolve to press on despite the obstacles and find beauty and enjoyment around her. (Small side note — I picked the small cover picture that reflects the cover of the copy of Island of the Blue Dolphins that I own. Isn’t it a great illustration? I like it much better than some of the other covers). When I decided to participate in “Blogging through the Alphabet” for the second time, I wanted to try and not repeat any “words” I used for each letter last time around. But I haven’t written very much lately about how we use the iPad in our homeschool, so I am going to “cheat” on my own rules and use “I” for “iPad” again this year. Over breakfast or early in the school day, the boys can be found doing their Bible listening using the YouVersion app. Miss M is often assigned at least one type of educational iPad app for independent practice each day. She likes Spelling City to practice her spelling list; Mathmateer, Math Blaster HyperBlast, Sushi Math and Marble Math for “fun” math practice; and GeoFlight USA to practice locating the states of the US. 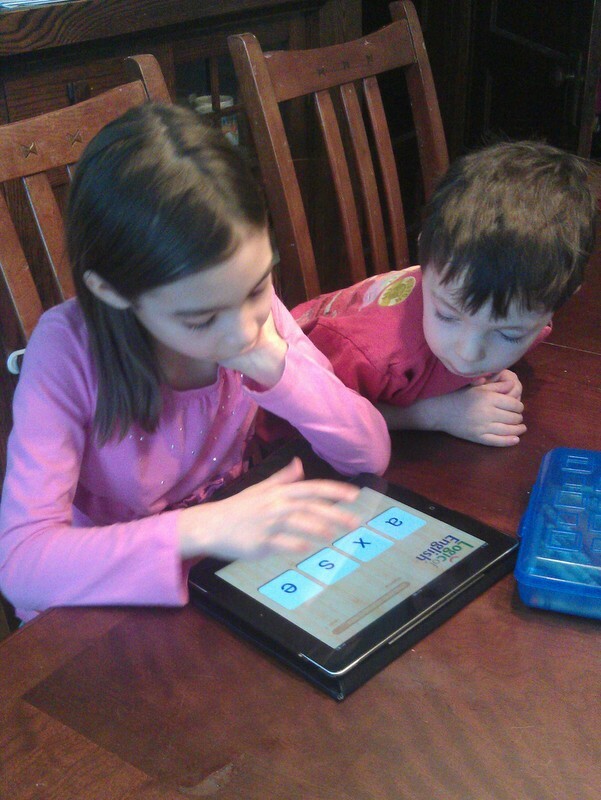 All three older kids practice their phonograms regularly with the Logic of English app. When it comes time for Logic of English Foundations (spelling/phonics) for Mr. E or BFSU science lessons, I often teach directly from the iPad since I have the teacher’s manuals in Kindle (in the case of BFSU) or iBooks (in the case of LoE). This year I’ve found playing calming music in the background really helps Miss M keep her stress level down during difficult math lessons, and it’s easy to find soothing instrumental music with the Pandora app. Of course, we still have plenty of “fun” with the iPad too. Sometimes it’s a nice break or diversion from the school day for the kids to have an educational iPad turn during which they can chose from any of our many educational apps. General favorites for free-choice educational turns (besides more time on the apps listed above) include the “Teach Me” apps (there are levels available for Toddler/Preschool through 3rd grade which each offer a mix of reading, math and other skills), Splash Math (various levels available), and the Brain Pop Jr. Movie of the Week. Mr K (age 4), also really likes ABCs of God, Eggy Words and Bugsy Pre-K.
At the end of the day, after school and chores are complete (or sometimes for the boys while they are waiting for Miss M during her guitar lesson), it’s time for anything-goes iPad turns. 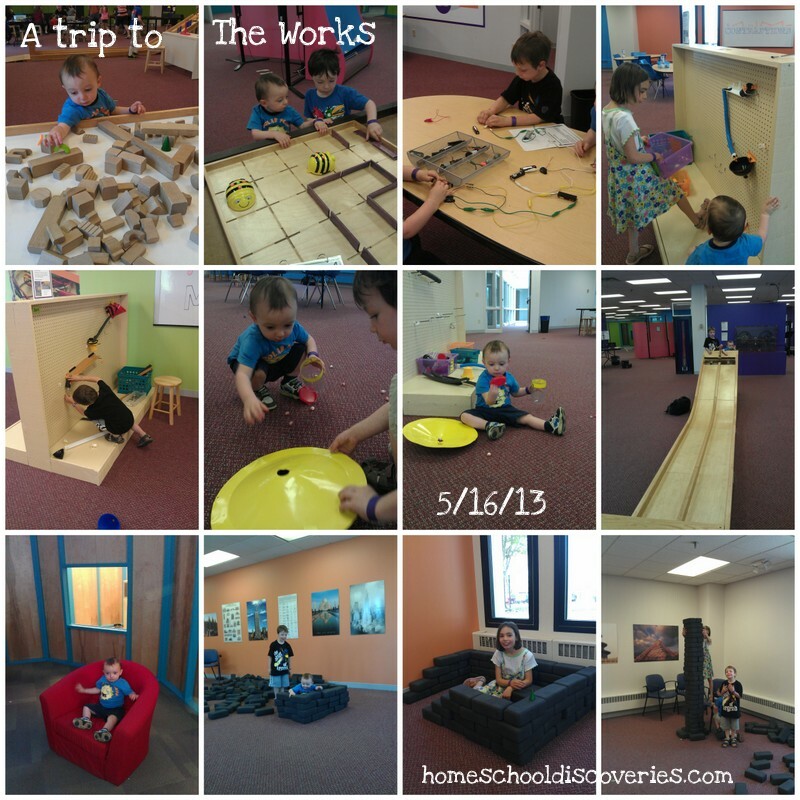 This is when the boys enjoy favorites such as Angry Birds Star Wars, Bad Piggies and Minecraft. Miss M often plays “My Horse” during a fun turn. Everyone likes the wide array of Toca Boca apps that we own (we have almost all of them!). The iPad is definitely an educational and fun tool that I am thankful we have! 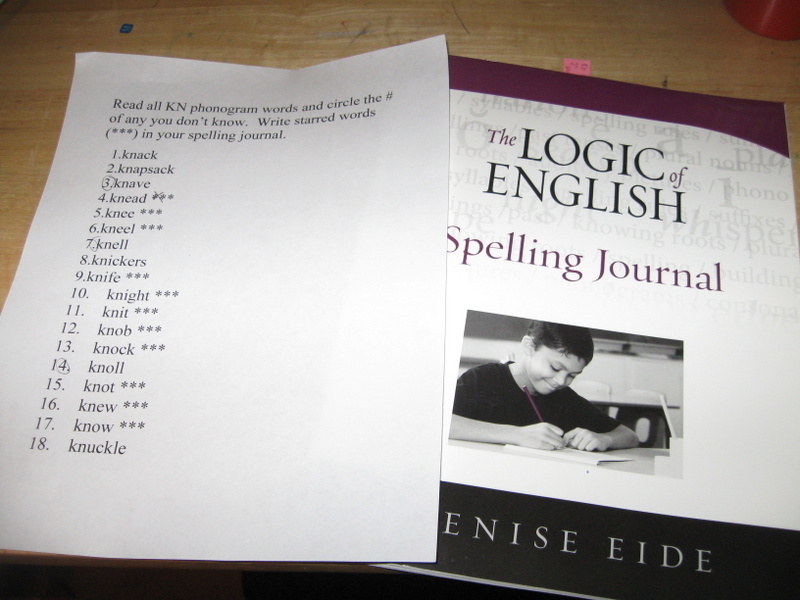 My initial review of Logic of English Essentials (also includes background of our previous spelling curricula attempts). I’ll just cut to the chase and talk about results first, then go back to some nitty gritty details of how we’ve used the program and our plans for the future. So, you can see why I was very eager to find a spelling curriculum that would work for us. Not only was Miss M making a lot of errors (though possibly not more than some other 2nd graders), her errors didn’t necessarily make sense…they weren’t always even phonetically regular errors! There were times when she would write something out, and later herself couldn’t even read what she wrote because of the types of spelling errors she was making. She told me she hated writing because it was so hard to figure out how to spell everything. So what does Miss M’s writing look like now? So, two errors. Miss M found the “outside” error quickly when I asked her to look at that word again. I then praised her choice of a phonogram for the /long e/ sound of “field,” in that it was a choice that made sense — then I let her know what phonogram she should have used instead. Miss M is only eight (she turns 9 in a few days!). I don’t expect perfect spelling from her. But I am super pleased that when she does make mistakes it is often a letter carelessly left out or written out of order (that she can find quickly upon review), a wrong-but-logical phonogram choice, or a word she really can’t figure out (but almost always knows she has spelled the word wrong, and marks it that way before she hands it over to me for editing). As she is writing notes on an almost daily basis these days (and doesn’t have to think so hard about how to spell each and every word), she’s applying her knowledge of spelling to the words she uses frequently, and is more consistently remembering which phonograms to use and how to apply the rules she has learned this year. One of my favorite comments from her recently came when I was reviewing a note in which she had spelled the word “flower” correctly, and I had praised her for this spelling. Her comment was, “Mom, I used a lot of logic to figure that one out.” 🙂 I think she may have had “flower” on a spelling list at some point, but hadn’t used that word much since then. Now she has the tools and “logic” to figure out a word like that even if she didn’t have the spelling automatically memorized. Now on to a few “nitty gritty details”, for those readers looking for that sort of thing! Each and every week we used the “lesson” on new phonograms, spelling rules, exploring sounds, and so on. We often played phonogram games and occasionally played spelling games. I dictated a spelling list to Miss M on each non-review week. We did some spelling journal assignments. For us, I found the grammar was too much for our priorities this year. I started out doing a few of the basic grammar lessons at the beginning of the program. But things started getting a bit more complex, and I didn’t find Miss M was retaining the information without spending a lot of time on it. Given that Miss M was only 8 for most of the the school year (we started using the program when she was seven), I know she has plenty of time to learn more grammar. We used an alternative, fun program to learn the parts of speech (Sentence Family — read my review here), and shelved the grammar portion of Logic of English Essentials. We also were somewhat sporadic about the writing exercises and sentence or phrase dictation. For much of the year Miss M found sentence dictation to be really stressful. I think she might be ready for more of that next year. As the program went on I noticed a lot of the written exercises were tied in to the grammar lessons, so I decided to find other ways for Miss M to practice writing her spelling words. Tuesday: Spelling list dictation. Because Miss M didn’t like the thin paper in the workbook if she happened to need to erase, I started having her do her lists in her own spelling notebook (just a little blank notebook from Target). After we developed that habit, Logic of English released an e-book version of the workbook. For students that don’t like the thin paper of the printed workbook, printing just the pages you need from the ebook is a good option as well. Wednesday: Independent spelling practice with Spelling City. I copied each and every list into spelling city, so Miss M could practice with the games on the computer. If we had time, sometimes we also did a game for phonograms and/or spelling words. On weeks where a Spelling Journal assignment made sense, she would sometimes do those as well. Thursday: Independent practice of spelling words out loud (Miss M finds it helpful to read the word and then spell it out loud a few times), and also either Spelling City practice or a phonogram or spelling game together. Including the final review week, Miss M still has four lessons left to complete her initial run through the Essentials program. At this point I plan to complete those lessons with her in the late summer. Then when we start the 2013-2014 school year next September, we will go through the Alternate/Advanced lists available on the Logic of English blog for LoE Essentials. I have not yet decided if we will use the grammar portion next year. 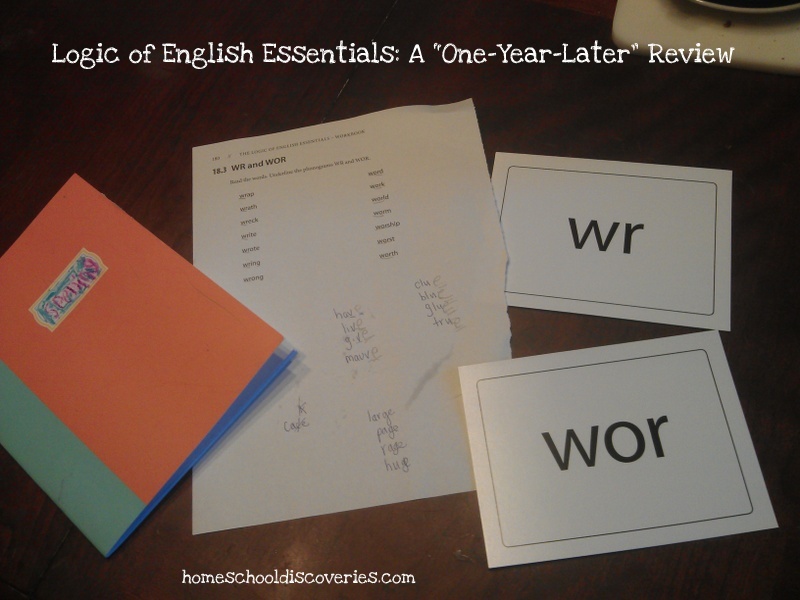 I have another grammar program in mind I had previously planned to use with my kids starting in 4th or 5th grade, but I don’t yet own that program so I need to do further research as to what I think will be best for Miss M.
If you read my earlier posts about Essentials, you may have noticed I originally planned to use the program with Mr. E, my Kindergartener, as well this past year. I did try and use portions of Essentials with him all fall — but I had a hard time getting the pacing and activities right for him. I ended up buying the Logic of English Foundations Beta in January to use with both Mr. E and Mr. K. In retrospect I really wish I would have bought it when it was first available in August! But it has been a wonderful nearly five months of using it (mainly with Mr. E so far). I am nearly all the way through Foundations, and that will deserve a review post all its own. But, since Mr. E has completed what is currently written of the Foundations program (levels A-D, though really mostly C and D since he came into that program with prior knowledge), I need to continue his reading and spelling instruction next year as well! Unless something wonderful and new comes along between then and now, I plan to try again on Essentials with Mr. E in the fall when he is a first grader. A lot will be review — but I think that’s okay, because he seems to be retaining his reading knowledge from Foundations better than he is retaining/applying his spelling knowledge at this point.